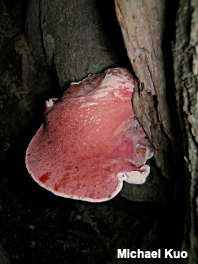 Sometimes called the "beefsteak" or the "ox tongue," this polypore is kind of gross, and virtually unmistakable. 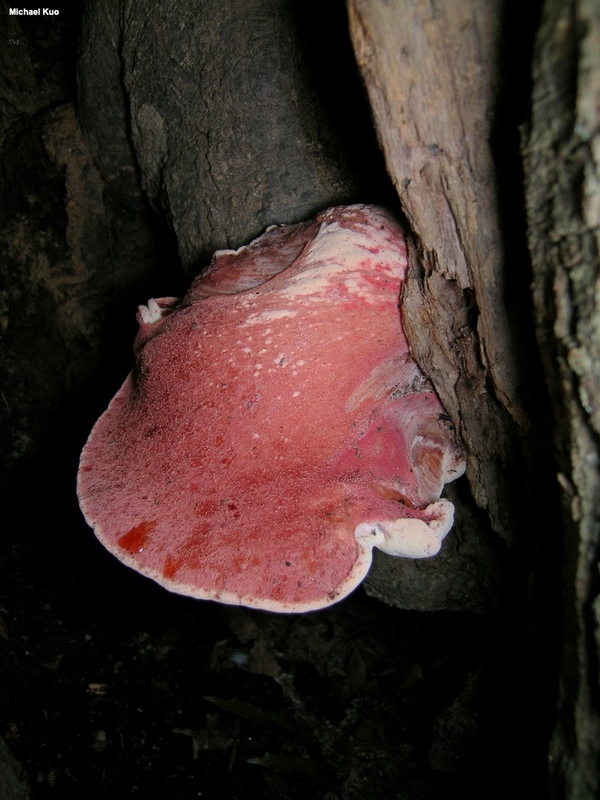 It looks like a slab of red meat clinging to a stump or a tree. 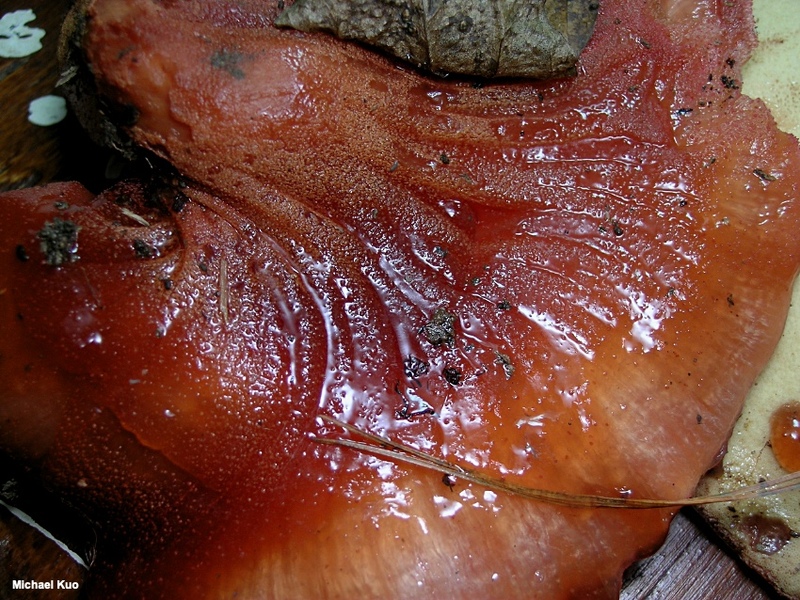 Its flesh is soft and streaked-looking, and when the mushroom is fresh it exudes a blood-like juice when squeezed. 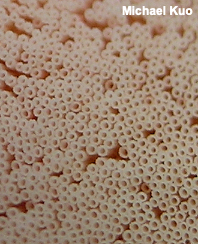 Its tubes are particularly distinctive, since they are individually discreet; with a hand lens (or much better unaided eyes than mine, I suppose) you can see each little tube composing the pore surface. 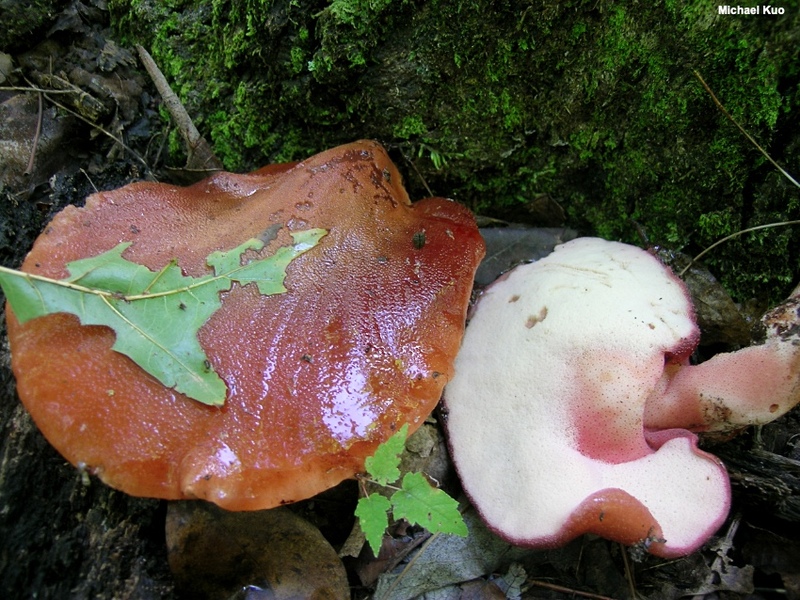 Fistulina hepatica is fond of oaks, and is widely distributed in North America, although it is more common east of the Rocky Mountains. Ecology: Saprobic and sometimes weakly parasitic on the wood of oaks and other hardwoods; causing a brown rot; annual; growing alone or in small groups near the bases of trees and on stumps; summer and fall; widely distributed in North America but much more common east of the Rocky Mountains. The illustrated and described collections are from Kentucky and Ohio. Cap: 7–20 cm across; 7–14 cm deep; irregular in shape but often semicircular, fan-shaped, or tongue-like, with a lobed and wavy margin; wet and sticky when fresh; finely bumpy; bald; liver red, reddish orange, or brownish red. 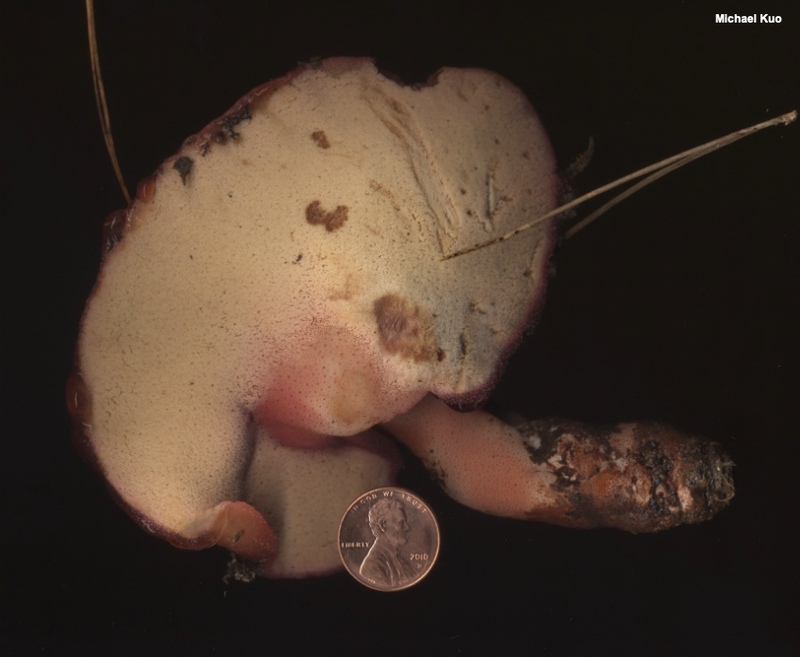 Pore Surface: White to pale pinkish, becoming yellowish and eventually reddish brown in age; bruising brown; tubes distinctly separated, to 1.5 cm long, mouths circular. Stem: Absent, or rudimentary and lateral; colored like the cap above, below whitish and covered with the pore surface; firm. 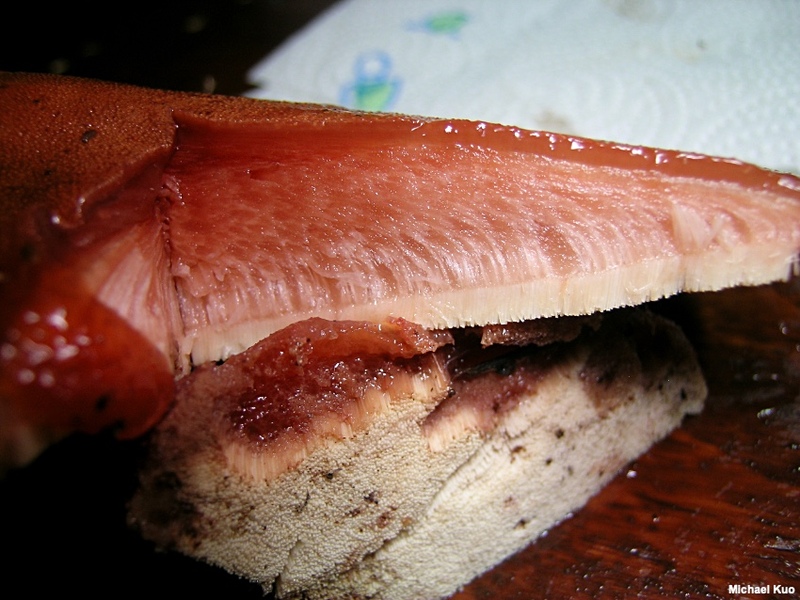 Flesh: Whitish, streaked with reddish areas; thick; soft; watery; exuding a reddish juice when squeezed. Odor and Taste: Odor not distinctive; taste sour or acidic. 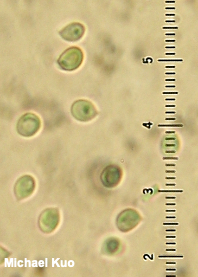 Microscopic Features: Spores 3–4 x 2–3 µm; widely amygdaliform to subellipsoid or sublacrymoid; smooth; hyaline to yellowish in KOH. Basidia 4-sterigmate. Pleurocystidia not found. 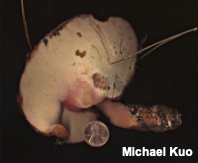 Hyphal ends at tube mouths cheilocystidium-like; 5–7 µm wide; cylindric to subfusiform with subacute apices; smooth; hyaline or golden in KOH; moderately thick-walled. Hyphal system monomitic. Clamp connections present. REFERENCES: (Schaeffer, 1774) Withering, 1792. (Fries, 1821; Persoon, 1825; Saccardo, 1888; Atkinson, 1901; Smith, Smith & Weber, 1981; Gilbertson & Ryvarden, 1986; Arora, 1986; Breitenbach & Kränzlin, 1986; Phillips, 1991/2005; Lincoff, 1992; Roody, 2003; McNeil, 2006; Miller & Miller, 2006; Kuo, 2007; Binion et al., 2008; Kuo & Methven, 2014; Desjardin, Wood & Stevens, 2015; Siegel & Schwarz, 2016; Woehrel & Light, 2017; Baroni, 2017; Elliott & Stephenson, 2018; Sturgeon, 2018.) Herb. Kuo 09241106.